Blanch the chicken carcass in boiling water for a few minutes. Then strain and scrub the carcass clean. Add chicken carcass, shallots and ginger to 1.5L water and slow boil for 1 hour. Strain the stock and transfer to another pot. Add the reserved mushroom water to the stock. Cut the chicken into bite-sized pieces and add into the stock. Bring it up to boil and allow it to cook for 30 mins. Add the softened mushrooms to the stock and boil for another 30 minutes. Add chicken stock cube and salt to taste. Now we need to make the ginger oil. Start by heating the cooking oil in a wok. When the oil begins to smoke, add the old ginger and fry until golden brown. Pour the ginger and frying oil into a bowl and set aside to cool. Drop the noodles into a pot of boiling water and cook for about a minute. Take care with the noodles as they cook very quickly and become mushy when overcooked. Then drain the noodles and rinse under running water. Drizzle the ginger oil over the cooked noodles and toss to evenly coat the noodles with the oil. Lay a few lettuce leaves in a bowl and place a portion of the noodles on top. 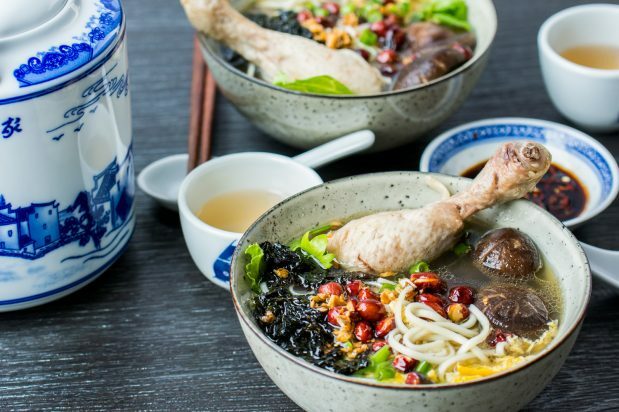 Ladle the soup in the bowl of noodles together with a few pieces of mushrooms and chicken. Traditionally, the must have toppings are the fried seaweed, and fried peanuts; all other toppings are optional and can be added at your own discretion. Serve immediately after adding your toppings.